Cumberland, the county’s largest business district. 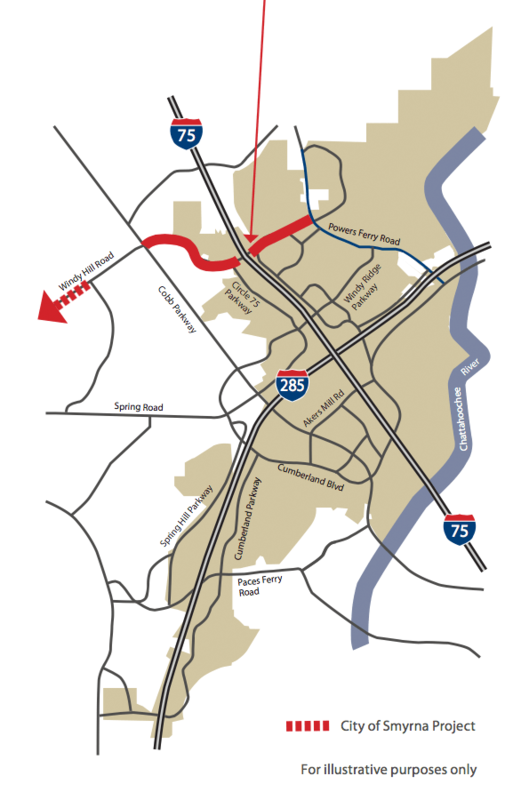 The East and West Corridor Improvements will focus on Windy Hill Road from Cobb Parkway to Powers Ferry Road. handle additional capacity and news medians for safer travel. crashes at a rate three times greater than state-wide averages; injury rates are double the state rates, according to a 2010 report. 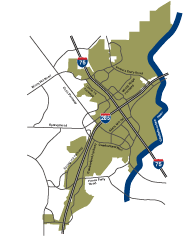 The interchange at Interstate 75, will be reconfigured into a Diverging Diamond Interchange, eliminating the left hand turns at traffic signals and improving vehicular flow without the addition of extra lanes. It will also include a bridgescape feature. 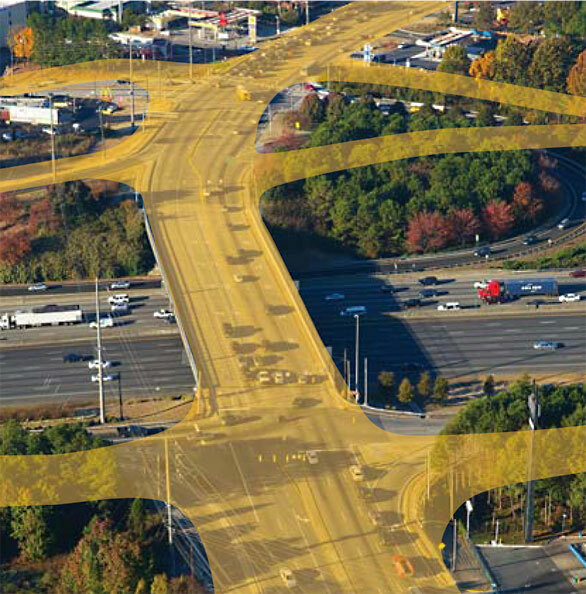 The Windy Hill interchange improvements have been part of the CID’s work program since its inception in 1988. It is the last remaining original project to go under construction. 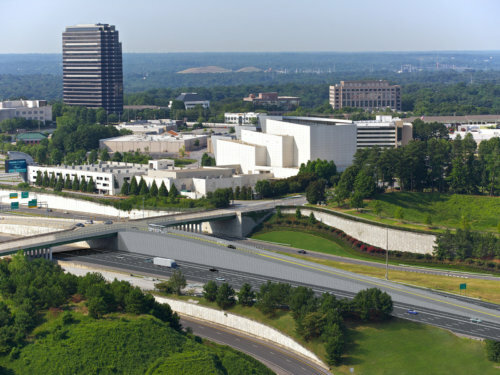 As U.S. Highway 41/Cobb Parkway serves as a critical north/south connection for Cobb County, Windy Hill Road serves as its east and west counterpart connecting Smyrna and points west to Cumberland, Cobb’s central business district. These enhancements are just a portion of the $85 million in total improvements planned for Windy Hill Road from Smyrna to Cumberland. Pedestrian enhancements for this corridor are set to include streetscapes with new sidewalks, LED pedestrian lighting, landscaping, and decorative mast arms. Vehicles accustomed to turning onto Interstate North Parkway at Pappasito’s Cantina, will instead turn onto Interstate North Parkway at the Spectrum Circle intersection. Similarly, vehicles traveling northbound on Interstate North Parkway trying to access Windy Hill Road will be diverted to the Spectrum Circle intersection. A triple left turn onto Windy Hill Road will be constructed at Spectrum Circle to handle the additional capacity. Diverging Diamond Interchanges provide a more efficient and safe travel pattern for vehicular travel with cars no longer required to make left hand turns to access the interstate. The innovative design has improved conditions by 20 – 30% in some parts of the country. 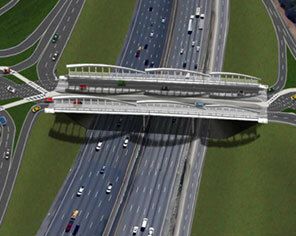 Diverging Diamonds are a cost- effective solution because the bridge is not reconstructed. Due to the length required for the Diverging Diamond Interchange at Windy Hill and Interstate 75, Circle 75 and Interstate North Parkway will be realigned. 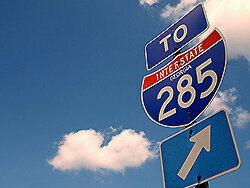 The project will include realigning Circle 75 with the Interstate 75 Southbound ramp and Leland Drive with the Pappasito’s Cantina entrance. Access to Windy Hill Road when proceeding north on Interstate North Parkway will be eliminated for through traffic (next to Pappasito’s Cantina). Traffic will be directed to the triple left intersection at Windy Hill Road and Spectrum Circle. Drivers may continue to make a right turn onto Interstate North Parkway from the Windy Hill Road exit off Interstate 75 Northbound. 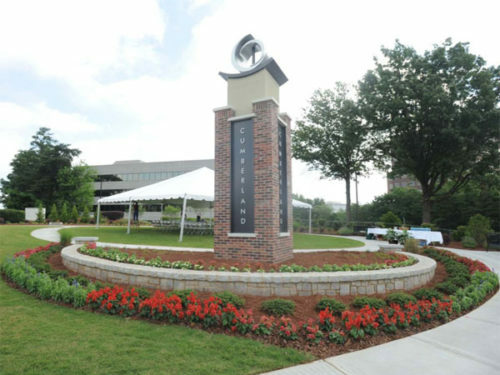 A traffic signal will be installed to help slow traffic moving onto Interstate North Parkway at the curve adjacent to the Marriott Hotel.